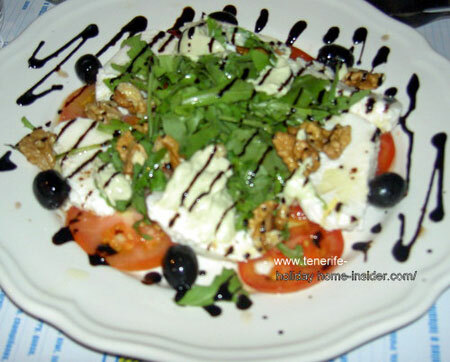 What's special about the Vegan fast food Restaurant Tenerife El Limon? The vegan fast food restaurant Tenerife El Limón comes with more than one surprise. Its business card reads: El Limón and 'Somos naturales'. The latter means: 'We are naturals'. The night image of the best Vegan restaurant Tenerife North beside may not be perfect, but gives you a good idea of its romantic setting. By the way, not much gives away in the street that this eating establishment is called El Limón in Spanish which means the Lime fruit. But the fact that it is even almost full up in the middle of any month is a good reason to explore it by eating there. Each of us ordered a Rucola salad. It was a nice attempt to create food art. However, it wasn't exactly a big portion. Meantime, this Arugula or Rucola salad was a good appetizer of healthy food. It contained mozzarella, nuts, avocado and olives besides its green rucola leaves. to prepare that dish of vegan fast food. Vegan fast food Bocatas or sandwiches for the hungry. like bocadillos and are more filling, you know. Bocatas come with all sorts of raw vegetables, such as avocado pears, cabbage, tomatoes, onions, carrots, peppers, leeks, baby marrows and zucchinis (calabacins). Hard boiled eggs, mushrooms, but also steamed brinjels, cheese, home made mayonnaise. All sorts of vegan sauces and pickles complement the taste. Seitan and Tofu fast food tapas sandwiches are not missing. Then there is also the Arugula or rucola which is often used as a herb for decorating and food art. egg, leek, pepino, pickles and sprouts. 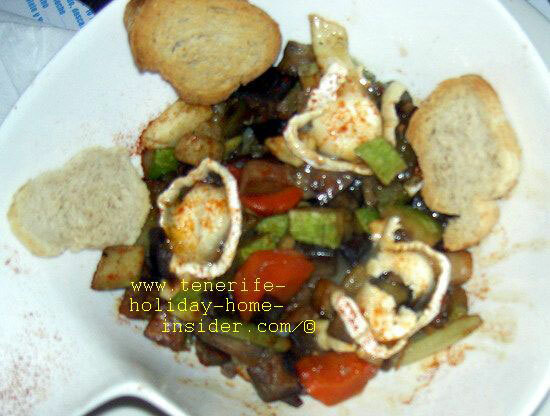 Of course, soups, rice and potato dishes of all sorts are not missing in the vegan restaurant Tenerife El Limón. There was an incredible variety of home made fruit and vegetable juices, vitamin boosters, energy drinks, alcohol free cocktails, your own choice fruit juice or cocoa mixed drinks, hot drinks, teas, all sorts of cafés and chocolate beverages, water, beers with or without alcohol, mosts, appletisers, nesteas, selected red and white wines by the bottle or by the glass, you name it. Seitan Meat made of wheat in vegetarian dish. We picked our main dishes from the so called Combinados. We selected warm meals. Even those were vegan fast food, as they could be prepared very quickly, contrary to stews, roasts or curries which are not part of this vegan fast food outlet called El Limon. My friend ordered its number 5 combinado degustación from the menu card which was the paper table place mat. 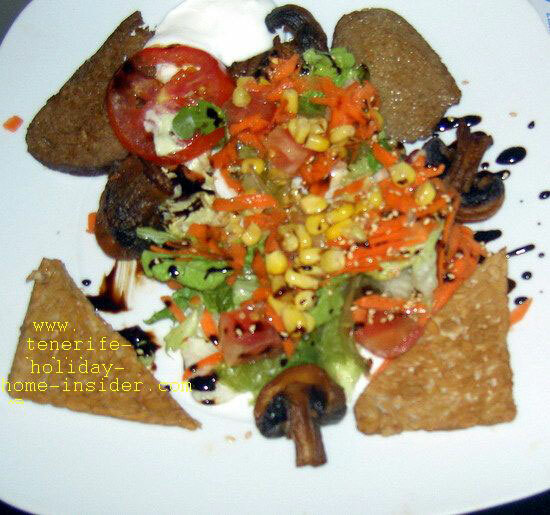 This combined vegan dish contained tofu and seitan which is the vegan wheat meat, as depicted by the two creme colored triangles of this vegetarian cuisine of various vegetables. I tasted a little of it. The dark brown triangles were tofu which is made of Soy beans. Nor my friend no I were too fond of this dish with tofu and seitan which replaced meat. Mind that those meat substitutes are acquired tastes which we obviously lacked. The vegetable stir fry which i selected was number 1 of so called 'Wok Combinados'. It was delicious, although not vegan fast food and even my friend who prefers to eat at the Ruen Thai restaurant quite liked it. complemented the vegetable wok dish well. Needless to say, stir frying is a fast way of cooking. However, we were still hungry. So there came the cake. My mind revolted, as I normally avoid eating sweet stuff. Besides cake is not vegan but generally only vegetarian, unless eggs and dairy are omitted. My friend had ordered a huge piece of fruit cheese cake. This cake with berries looked so tempting. Forest berries topped up a large base of lemon cheese cake which was made with cottage cheese. My dinner companion raved about it and gave me an inviting taste. It was the most delicious fruit cheese cake. That's when I decided to go for it, too. After all so far, our calorie intake by vegan fast food had been extremely low. Expensive vegan restaurant Tenerife El Limón ? We spent almost €40 for vegetarian and vegan fast food that evening, while we only drank water. You certainly could have eaten cheaper in a Tenerife guachinche, although the fast food vegetarian menu of the day was advertised for only €10 on our paper place mats. In fact, many of the a la carte dishes which were served looked a little like designer food. Such cuisine is not very filling. Normally, big eaters cannot replace their normal meat helpings with enough tofu, seitan, vegetables and salads. But, you shall get used to any new eating habits, as is the case with everything. Easier said than done. 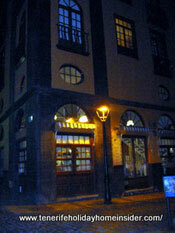 Anyway, all in all the vegan cuisine of Restaurante El Limón is special and delicious, as its full house of food fans proved. We came to that conclusion after the cake had earned the missing best points. Just now, find the address and a description of the interior of the vegetarian restaurant, while also discover why it deserves to be called a ladies restaurant... Indeed, it is highly loved by the local Spanish girls and Spanish women with higher standards. Vegan fast food location is only very slightly off the beaten track. From vegan fast food back to Tenerife restaurants.